DRIFTWOOD, Texas — They say a picture is worth 1,000 words. But two teens,Mario and Araceli, claim taking selfies with a popular actor cost them their jobs. Salt Lick BBQ -- in Driftwood, about 25 miles southwest of Austin -- is one of Central Texas' most popular barbecue joints. It's no surprise celebrities often pay it a visit. Last weekend, Ice Cube's son, O'Shea Jackson Jr. -- who played Ice Cube in the hit movie, 'Straight Outta Compton' -- got a taste of the restaurant's goods. "I'm a big fan of that movie," Mario said. "Yeah, I'm a big fan of that movie, too," Araceli said. The teens were working at the restaurant during Jackson's visit and wanted to take a picture with him. They told KVUE they clocked out and met Jackson outside the restaurant. "We walked out, right? And we looked to our left and he's there, walking out to the SUV that he was going to drive away in. And we're like, 'Oh, my God,' you know? 'There he is,'" Mario, 17, said. They each took a selfie with the actor. "I was shaking pretty bad after. I was expecting to get rejected. He didn't look like he was trying to take a picture," Araceli, 18, said. But then, the teens said their manager at Salt Lick fired them on the spot -- in front of Jackson, his bodyguard and other customers. The teens claim they were fired for taking the selfies with Jackson. In a now-deleted tweet, Jackson tried to get the restaurant to give Araceli and Mario a second chance. "That was a huge shock, and we were fan-girling pretty hard," Araceli said after seeing Jackson's tweet. 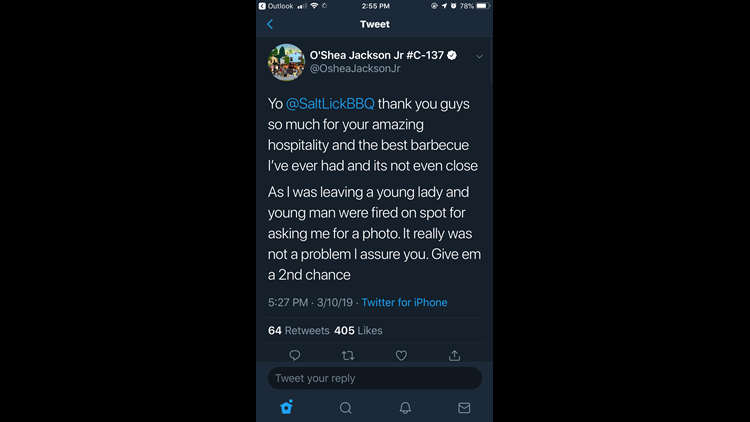 But Salt Lick BBQ wants to make it clear: they didn't fire the teens for taking selfies with the actor. "This weekend we had the pleasure of hosting O’Shea Jackson Jr. at the Salt Lick. Unfortunately, two of our employees repeatedly left their stations in an effort to take pictures with Mr. Jackson. After multiple warnings, the two employees abandoned their posts, were disrespectful toward fellow staff members, and neglected their duties to secure a picture. We take great pride in our Hill Country friendliness and strive to provide the best experience possible for every one of our guests. This requires the entire staff to work together and complete their assigned responsibilities on every shift." Now, with both teens unemployed, it was worth asking: Was it worth it? "I mean, to get O'Shea Jackson's attention, for him to tweet about it...I think so, honestly, in my opinion," the teens said. "Best thing that came out of it." The teens may be out of a job, but at least they have a selfie with Jackson to remember it by. But that's not all! Jackson has offered to give the teens tickets to Ice Cube's show on Sunday, March 17 at ACL Live.